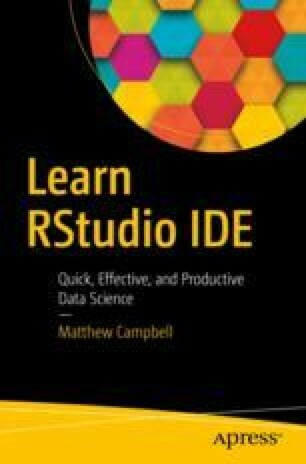 Let’s continue our tour of RStudio IDE. RStudio has a four-pane window layout and we have looked closely at two of the panes already in the last chapter. We have seen the Console screen, where you can write interactive R code, and we saw the Environment and History screens, where you can see the state of your R environment. Our data frame also opened up in a third pane, but we can do more with this part of the RStudio interface. Let’s take a look at the remaining screens that we will be using now.